We buy junk cars, vans, SUVs, and trucks and pay cash in Maryland! We are Maryland's top junk car and truck buyer. We buy junk cars in Maryland so you can get rid of that rusted car that’s taking up space in front of your home. If you’re trying to find who pays the most cash for cars in Maryland, look no further. The Clunker Junker helps Marylanders like you sell your junk car as quickly as possible, and get the most money for it as possible. So rather than waste all your time dealing with flaky junk car buyers on sites like Craigslist, call The Clunker Junker today and get an instant offer right now. Did we mention that when we pay cash for junk cars in Maryland, we also include free pickup and removal as well? It doesn’t get any better than that. Maryland has been named “The Free State”, and we like that name because we buy junk cars in Maryland and pick them up for free! So if the junk or used car in your driveway is making your wife a little crabby, we have you covered. We’ll get it out of your hair in no time. Of course, we’ll be paying you a fair offer for your car when we pick it up. You can have your Maryland crab cake, and eat it too! Edgar Allan Poe happens to be our favorite historical Marylander. So if you’ve awaken one night upon a midnight dreary, and pondered to yourself, weak and weary: “I need to sell my junk car”. Then it’s time to call The Clunker Junker. We’ll gently tap and rap at your chamber door, then pay you cash for your car. “Will I ever see my junk car again?”, you’ll ask. Quoth The Clunker Junker, “Nevermore!”. From Hagerstown, to Baltimore, to Salisubry and everywhere in-between, we’re hands down the best and most reputable junk car buyer you’ll find. We buy cars in a wide variety of conditions and ages, but we need some details to know what sort of cash offer is fair for you and your vehicle. You can start by telling us the make, model, year and current condition of your car. These factors will influence how much your car is worth, but it also helps us find the right buyer for your car. The Old Line State was quick to take advantage of our Maryland junk car removal services. We work with junk yards as well as private buyers to give you a fair offer on your car. All you have to do is answer a few questions on our website, and we’ll give you an offer right away. Getting cash for junk cars in Maryland has never been more convenient. After you accept our instant offer we’ll schedule for one of our awesome junk car buyers to pick your car up from its current location. You don’t need to pay for towing, or any other fees, we take care of everything. How much can I get when I sell my junk car in Maryland? Your car’s worth depends on when it was made, the model, make, and the current condition of the car. Junk cars usually fall into 1 of 3 categories, they are either beaters, “kind-of” junk, or only junk by definition. If that beater has been in your side yard for years because it can’t move, the car is junk. At The Clunker Junker, we deal with these cars all the time. You can get cash for cars that don’t start or vehicles that have extensive body damage. The best way to find out what your car is worth is to request an instant offer. For most cars like this in Maryland we can pay between $75 and $300 depending on age. A lot of junk cars have useful, working parts that the manufacturer doesn’t make anymore. These cars might see a few hundred dollars through an instant offer with The Clunker Junker. Auto salvage yards will piece apart these cars to find the useful parts. There are a lot of cars that are considered junk by insurance companies that people can’t afford to fix. We still deal with used vehicles that haven’t seen their last days. We typically pay out anywhere from $200 to $10,000 for cars in this category, which is more than you’ll get from other local Maryland junkyards. We have put together a simple guide and example for how to sign your Maryland title when you are selling your vehicle. If there are multiple owners listed on the title, they must all sign the title unless the names are separated with "OR". On a Maryland title you'll want to sign and print your name in the section on the back of the title that says "Assignment of Ownership". Complete the online Maryland replacement title form. Alternatively, fill out the Maryland Application for duplicate title form. Bring your completed application and replacement fee to your nearest full service MVA office. Please note that there may be awaiting period before a duplicate title can be issued and the cost is $20.00. (Paid to the MVA). Getting rid of an abandoned vehicle in Maryland can be a difficult process. Unfortunately, you cannot just sell any junk car that ends up on your property if you do not own it. You'll need to follow the Maryland abandoned vehicle removal procedures. We have given a general overview of what that entails below. To have an abandoned vehicle removed from your private property, you must contact your local law enforcement office. 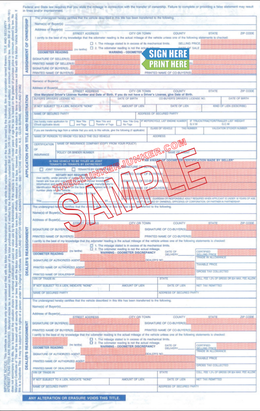 If you would like to apply for a title to the vehicle, you must attempt to contact the last registered owner of the vehicle via certified mail. If no known owner is found for the abandoned vehicle, or the certified mail has returned undeliverable, a notice shall be posted in the circuit court where the vehicle was left abandoned. If no owner has claimed the abandoned vehicle (3) three weeks after the notice has been posted, the vehicle may be sold at public auction. 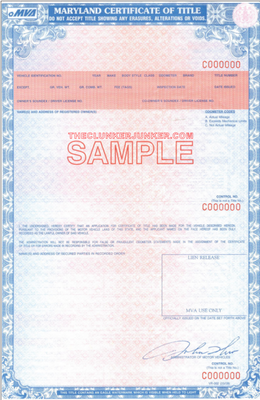 The new owner of the vehicle will be given a sales receipt and Certificate of Salvage with which they may apply for a title to the vehicle. Can you buy cars with no title in Maryland? With some notable exceptions, no, we cannot. Our Maryland junk car buyers generally do not buy cars unless you have a valid title in hand. 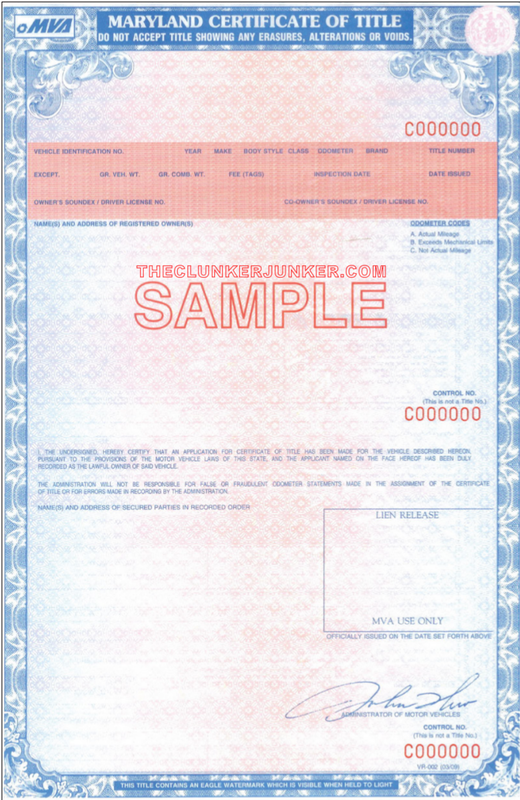 However, the legal owner would be able to obtain a replacement title through your local MVA. We would be able to purchase your vehicle with a replacement title. Maryland often changes their title documents from year to year. 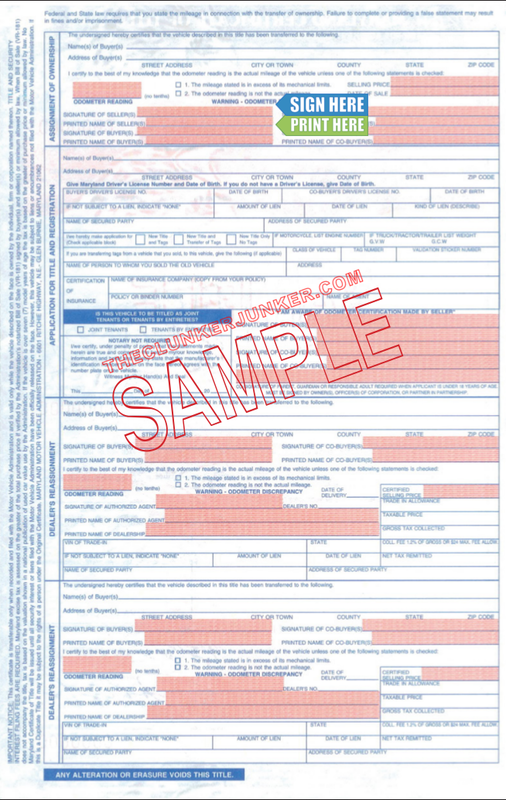 If you have questions about your specific title, please contact your Maryland MVA. Yes, unless you are transferring the plates to a new vehicle. You can return the plates to your local MVA office. You may need to notify your local MVA that you have sold the vehicle. You can contact them with any additional questions or concerns about the transfer of your title. We buy junk cars in Maryland, and do it with integrity. There are a lot of shady people and companies in the junk and used car business. When you sell your junk car to The Clunker Junker in Maryland, you can be sure you’re working with an established company who prides themselves on one of the best reputations around. Go check out our online reviews, and take special note of how many reviews started negatively, but our awesome customer service team took care of the customer to make things right, convincing them to improve their rating. You won’t find that level of service from any other junk car removal company. "The car runs fine, but something is wrong with the steering column, currently. I have decided to just junk the car instead of paying to fix it just to sell it anyways." "It is a complete car, it doesn't start, the driver-side doors and bumper are from a 2002. In 2012, we had an apartment fire that was so large that the flames melted the bumper of the car parked across the street. That's why it was replaced. The doors were switched out due to dents. " "It has a brand-new catalytic converter, brand-new tires, a brand-new front end (hood, bumper, lights) and front brake pads and rotors. The reason I need to junk it is that it's leaking power steering fluid and needs a new rack and pinion." "One tire is flat (front passenger). We have replaced numerous items (new battery, spark plugs, sensors, etc. ), and we still could not pass smog. The car stopped running one day, and we just can't afford to keep putting cash into it." "The car was running a week ago, but it wouldn't start after work. I thought it may have been the battery, so it was removed but not replaced, as I decided against keeping the car." "The vehicle runs well. The problem is that it doesn't stop. I'm junking it because I don't have the time or patience to get the brakes fixed. It does have a brand-new battery. " The Clunker Junker is one of the top junk car buyers in the state of Maryland. To date we have made instant offers on over 30 thousand vehicles across the state, totaling over $8.1 Million offered! We were not able to purchase many vehicles without a valid title. We also buy cars on a wide spectrum of conditions and 54% of the vehicles we've made offers on in Maryland do not start or drive. Many also have moderate to severe body damage. Baltimore in Baltimore city was our top producer, followed by Silver Spring.